Once again, we are forced to ask ourselves how and why a young man could have kept this to himself after so many years. Another interesting point when considered in a prejudicial context: Michael claimed, when interviewed by Sutton Associates, that he could not remember when he first realized Martha was dead. To the average person, such a realization would have been a frightening and unprecedented moment of devastation. Not a moment, in short, one could easily forget--even if wanting to. One reason why Michael may not have been able to pinpoint the time when he was made aware of Martha's death, could be because he knew she was dead before anyone else. 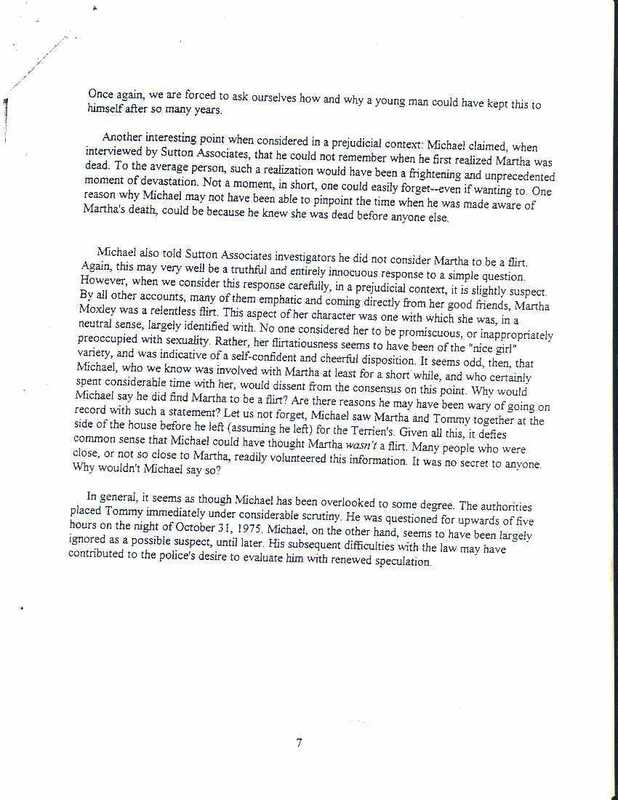 Michael also told Sutton Associates investigators he did not consider Martha to be a flirt. Again, this may be a truthful and entirely innocuous response to a simple question. However, when we consider this response carefully, in a prejudicial context, it is slightly suspect. By all other accounts, many of them emphatic and coming directly from her good friends, Martha Moxley was a relentless flirt. This aspect of her character was one with which she was, in a neutral sense, largely identified with. No one considered her to be promiscuous, or inappropriately preoccupied with sexuality. Rather, her flirtatiousness seems to have been of the "nice girl" variety, and was indicative of a self-confident and cheerful disposition. It seems odd, then, that Michael, who we know was involved with Martha at least for a short while, and who certainly spent considerable time with her, would dissent from the consensus on this point. Why would Michael say he did [^] find Martha to be a flirt? Are there reasons he may have been wary of going on record with such a statement? Let us not forget, Michael saw Martha and Tommy together at the side of the house before he left (assuming he left) for the Terrien's [Terriens']. Given all this, it defies common sense that Michael could have thought Martha wasn't a flirt. Many people who were close, or not so close to Martha, readily volunteered this information. It was no secret to anyone. Why wouldn't Michael say so? In general, it seems as though Michael has been overlooked to some degree. The authorities placed Tommy immediately under considerable scrutiny. He was questioned for upwards of five hours on the night of October 31, 1975. Michael, on the other hand, seems to have been largely ignored as a possible suspect, until later. His subsequent difficulties with the law may have contributed to the police's desire to evaluate him with renewed speculation.